The flavor is pleasant and sweet, but one-dimensional in that there is no acidity to balance the sweetness - which is not necessarily a bad thing of course. The texture is essentially crisp, but not as crisp or hard as a Braeburn or Jazz - it is more the slightly softer crunch you might find in a Golden Delicious. Ambrosia benefits from being kept chilled and eaten from the fridge, because the crispness fades fairly quickly once it is left in the fruit bowl, and at this point it can become slightly pear-like. If you wanted to pigeon-hole Ambrosia, it is best thought of as a red/orange colored Golden Delicious with a flavor which is not quite as sweet. Certainly anyone who likes Golden Delicious but wants something a little bit different will like Ambrosia. Ambrosia originates from western Canada and as with most modern varieties, production and quality are closely-controlled by the brand owners- PICO (Okanagan Plant Improvement Company) in western Canada. New plantings are also being established in Washington State in the USA, and in the Piedmont region of Italy. Although Canada is usually considered as a cold-climate growing region, the Similkameen and Okanagan valleys of southern British Columbia are semi-arid and apples are grown alongside grape vines and other warm-climate crops. Ambrosia is unlikely to be available to private individuals, but when grown in commercial orchards, the best rootstock appears to be M26 rather than the more usual M9. Unlike most other modern varieties, Ambrosia is not the result of a lengthy scientific breeding programme, but instead originated the old-fashioned natural way as a chance seedling in an orchard. Ambrosia was discovered by Wilfrid and Sally Mennell growing in their orchard of Jonagold trees in the Similkameen Valley in British Columbia, western Canada. The parentage is therefore unknown, but it seems likely that it is a cross between Jonagold, and Golden Delicious which had been growing in the same area previously. In terms of both flavor and appearance Ambrosia is almost exactly what you might expect such a cross to be like, with the flavor very much from the Golden Delicious side of the mix (bearing in mind that Golden Delicious is also one of the parents of Jonagold), but the visual appearance quite influenced by the Jonathan. My wife and I had our first Ambrosia apples several weeks ago and have been buying them ever since. They are incredible. We both feel they are superior to Honey Crisps. Highly recommend to keep them refrigerated. My go to apple when it is in season! Check them carefully for bruises and make sure they are fresh, not mealy. Ambrosia will be crisp, sweet, fruity and leave you wanting for more. I just had my first Ambrosia apple today from Sprouts in Green Valley, Arizona. It was on sale for .99 cents a pound, and they looked beautiful so I figured I get some, and omg. It has got to be one of the best apples I have ever had. I did have it chilled from the fridge. It was so crisp, juicy, sweet, just delicious. I am on an extremely strict diet where I can basically only have two fruits a day and this was certainly a delight. I am very pleased with this variety of apple. This is the first apple (could be an imitation) that I flat do not like! Nothing sweet about it, just bitter. I don't mean sour, but BITTER. I love the crisp crunch, though! Eating one now. I like the lighter crunch and sweetness, easier to eat in hand than some harder apples. Terrific right out of the fridge, but if you like a good panini, leave these in a bowl for a day or two, then slice thin and grill on a hearty bread with a good Raclette or Gruyere and sliced ham. Definitely a good pear substitute for any recipe. When you can find the authentic Ambrosia, it is truly worthy of its name ambrosia. Unfortunately, in recent years we have bought apples passed off as Ambrosia but are nothing like it. I don't know if it is the stores or the growers here. Ambrosia looks very similar to a few others varieties available in NZ. The real, or best, Ambrosia is short and round, compared to NZ's Royal Gala and other varieties. The pink-red stripes are more distinct and evenly distributed primarily around the belt and bottom of the apple, with the crown of the apple displaying a lot more yellow colour not covered by the stripes. The bottom of the fruit often has a visible hollow inside what is the remains of the opening of the flower. This hollow can sometimes be deep. The yellow colour of the skin is brighter than the other varieties, too, instead of having a green tint. Its flesh is honey-coloured or pale gold, not antique white. 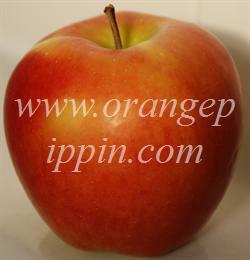 Its consistency is crisp but tender, not a strong crunchy like in a Braeburn. I have purchased Ambrosia apples for several years in a row, hoping I would discover the taste and texture that everyone says is so amazing; I have been disappointed every year. I find the apples hard, very crunchy (this seems to be the style of modern apples) and juicy. It is a beautiful looking apple, the flavour is sweet, similar to Red Delicious, but I find it has no counterbalance of sour, so for me, it's average. The flesh is much too crisp for my liking. It sits in the frig a long time, no-one else in the house seems to enjoy them either. Saw these in the store about 5 yrs ago when they were on sale for $1.49 lb. Their firmness and aroma intrigued me so I bought a couple to taste. In my very first bite I knew this variety of apple was very different than any other apple I had ever tasted. Firm, crisp, sweet and juicy with a floral smell. And it actually reminded me of an ambrosia salad with its fruity flavors and sweetness. It is my favorite apple of all time and is great eaten raw, diced in salads or oatmeal or baked. I love love love this apple and can't get enough of them when they are in season. I am lucky that our Stater Bros grocery store carries them about 8 months out of the year. So when they go on sale I stock up, they keep up to 2 months in the crisper drawer in the fridge. The only drawback is that no one is offering the trees for sale. The demand is so high that they are only selling tree stock to orchards growing for resale. If you think all apples are boring, bland, dry, mealy and tasteless you have got to find and try Ambrosia apples you will be pleasantly surprised! This is one of my top 10 apple picks. Only Gala or Cox's Orange can beat or come near to it. I personally like to by them at the market and the leave them in the fruit bowl for several days. What a treat! Bought these by accident ($2.70 / lb kinda ritzy) but was blown away. I cook Red Delicious with ham and cheese. and eat Fuji fresh all the time, but these were really different. Crisp AND watery with subtle aromatic flavors and smells. Moderate sweetness, and zero tartness. Reminded me of eating a flowery (but crisp) watermelon. If you hate Granny Smith and other 'tarts' you will probably love these. Glad I bought them (once) but I'll stick with my 99 cent Fuji's. Nice looking apple. Crisp, but not too firm. Juicy and exceptionally sweet with a pleasant flavor. The sweetness was almost overwhelming though as it had no tartness or acidity to counterbalance it, which I prefer in my apples. Very nice dessert apple nonetheless. Sweet and crunchy. Good flavor but no bite. Great for those who prefer sweet over sour. Best apple I've ever ate! Can't imagine what happened with the 2 that said "tasteless", maybe got some that weren't ripe? Or maybe lacking the ambrosia taste bud! Lol, try them again. Crisp, juicy and absolutely tasteless! If that's how you like your apples you'll love this, if not you won't. Yes! These apples are fabulous, crisp, sweet, pretty. Unfortunately, the ones at my local bodega often have stem holes from other apples, but you can't fault the apples for that. Double yes to Beverly - red delicious are mealy and yuck. I don't think ambrosia has RD parentage. The ones from BC are amazing, you have to refrigerate them and eat them cold. It's the perfect apple. I did a blind taste test of 12 apples available at our grocery store. The moment I felt the texture of Ambrosia I was hooked. I waited for the tartness and there was none. I was so relieved. Then the sweetness came and no icky aftertaste. My definite pick for #1. I got two of these from the supermarket and was not impressed. A fairly crispy, but rather tasteless apple. More like Kiku than Golden Delicious to me. I liked it a lot. Always been an apple eater but after having an ambrosia apple I was hooked! Now, nothing compares & find other varieties a disappointment when I can't find ambrosias. Our kwik trips are the only stores I've been able to find these at so I'm sure I haven't even gotten to enjoy a top quality one yet! Hands down the best apples I've ever eaten! Great texture; sweet, juicy, pretty. Decent apple for eating. Like, oh my goodness. This apple is, like, the best thing I've ever put in my mouth. My brother works in savromento and I can't wait to tell him about these apples. How you like dem apples? A lot! I don't like golden delicious much at all, and I find red delicious mealy and awful, but I ADORE ambrosia. We used to buy "apples" but now we buy "ambrosia" and "pink lady" apples. Yum! I would love to learn how to get my own to plant. Yes, this apple is awesome, the taste is exceptional, the crispy snap when you bite into one is perfect, I am not a huge apple lover by any means but this apple is the bomb, and yes this is my first review on any kind of fruit, You just cant beat it, and as far as size ours in Michigan are huge !!! don't ask me why. AAA+ rating. I use to be a Golden Delicious fan, and then Gala, but now I don't bother to buy apples if the store doesn't have them. They just came in to the store in April, can't get enough! Very good apple. Not too tart, but not too sweet. Crisp with a nice crunch. Happened across these two or three years ago and suffer greatly when they are not available. Have tried ALL the other varieties, but none come close to the Ambrosias. Very well named, truly a fruit of the gods!!! The Ambrosia apple is the best apple I have ever tasted. I too want my own tree! I have never been a person to just sit and eat an apple other than in something or cooked. Last year I happened across organic Ambrosia apples and loved them. This year I again looked for them and just recently found them in the store. They are hard to find and so good. I would love to plant a couple in my yard but I'm having a hard time finding where I could get a tree. Any suggestions? Just picked some last week. Flavor is sweet and very crisp. However, the apples are quite small. Prefer Honeycrisp and Fuji for fresh eating. Auvil Early Fuji is excellent. For baking Jonaprince is the best. We agree this is definately one of the nicest tasting apples available at the moment. Would like to grow some ourselves . yess ambrosia is one of the best ! This is the best apple I've ever tasted. It's the sweetness, without any tart, that I prefer. For the last two years (2007/2008) I've been able to get the organic Canadian variety which far surpasses the taste of the organic American variety I've had this year (2009). I'm desperate to have a tree of my own. Ambrosia: I think there were also Red Delicious apples grown in the orchard where the chance seedling Ambrosia was found and judging by the distinctive "Red Delicious Bumps" on the bottom of Ambrosia apples and the long "Red Delicious Typiness" of Ambrosia I assume Ambrosia has Red Delicious as part of its parentage. Climate suitability: Tolerates cold winters Sensitive to frost.